As you will have seen, by name is Phil Cooper, and my callsign is GU0SUP. I am currently employed in a small electronics factory where we build circuit boards for many companies. Check out http://www.offshore-electronics.co.uk for more info. My job is checking boards after they have been through the surface-mount process, and repairing any defects found. To me, this isn't a job, more of a hobby. We used to have two kitties as well, but sadly, they have both been killed in road accidents. Marmite was killed a few days before Christmas 1999, and Toast a few days into the New Year 2000. We both still miss their peculiar ways around the house. In February of 2000, we went to our local animal shelter, and "rescued" Jess - that's her on the right. She is a black and white kitty and was about about 2 years old when we got her, although we could not be sure of her age. Jess was very nervous of anything and everything when we first got her home, but now, she is an amazing cat, and gives us loads of love and affection. Penny and I were married on 8 September 2000, at St James concert hall in Guernsey. It was the second time round for both of us! The picture shows Penny and I inside the hall. I was born in 1953, in London, but grew up in the forest around High Beach, near Epping, Essex. Itchy feet took me to Guernsey in 1974, where I seemed to have taken root! I was first licensed as GU7LSX on 10 February 1992, and then got my full license on 20 December 1992. However, my first HF contacts didn't start until January 1993. It took me 5 months to start using CW on HF, and then, in 1994, I discovered the joys of RTTY. Since then, I haven't done any SSB, and my main interest lies in the digital modes, although I still use CW occasionally. Despite forays into PSK, Throb, MT63, my preferred mode is still RTTY. Originally, PSK was great, as everyone was checking each others signal levels, and help was abounding, but now, it would appear too many people "plug & play" and just go, with little or no consideration given to ALC levels, etc etc. In the early days of PSK, most people were happy using 5 watts or so, and this was great, Nowadays, it is not uncommon to hear folk boasting of using hundreds of watts. You will find me in most RTTY contests, and often on the WARC bands with RTTY outside the contests. I am trying hard to achieve DXCC on 30m and 17m, but I guess 12 m will have to wait until conditions improve a little more! I am the RSGB QSL sub-manager for the GU and MU series calls. To find out more about the Guernsey Amateur Radio Society, try this link: G.A.R.S. I am a member of the Chiltern DX Club. In 2011, I was made an honorary member of DRCG, the German RTTY Contest Group. Besides amateur radio, I enjoy sea-fishing and stamp collecting. I also keep tropical fish, and have a pond in which I keep Shubunkins and a few Koi. Way back when, I used to ride a motorcycle, but gave that up around the age of 30, when responsibility supposedly took hold, and I got a car. 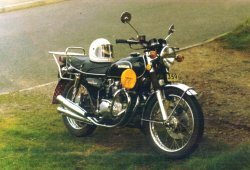 Back then, I rode various bikes, starting of with a BSA 250cc Starfire. I then progressed to a BSA 650cc A65 Lightning. Although this was a great bike, it did have that old "British-bike" habit of falling apart! After getting fed up with dropping the exhaust pipes on the road every now and again, I traded it in for a 4-cylinder Honda 500cc. That then got traded in for a Honda 550-4 K1, which I had until I gave up riding. In September of 2006, I took the plunge and bought myself a new Royal Enfield Bullet. This is a 500cc single cylinder bike, now built in India, but based on the 50 year old design of the original Bullet. This is a picture from 1974, aged 20, and shows me on my BSA A65L Lightning. I had this bike from new in 1971. On the right is my Honda 500-4, which was an amazingly reliable bike, taken around the late 70's. Sadly, I don't seem to have any pictures of my Honda 550-4. Below you can see my brand new Royal Enfield Bullet! Move your cursor over the picture for a larger image. Built in India, but with a new-design, lean-burn engine, and a new 5-speed gearbox. It still retains the kick-starter, but also has an electric start for when you don't feel energetic. 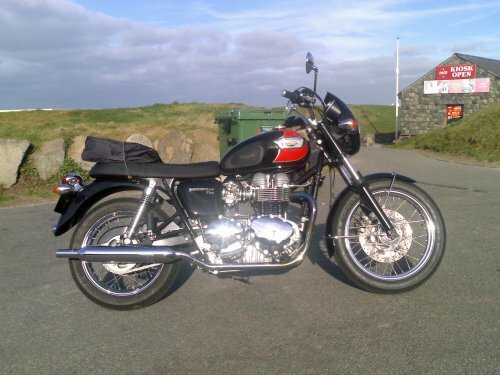 I part exchanged this in January 2008 for a Triumph Bonneville T100, shown below! Move your cursor over the image for a bigger picture. Built in Leicester, England, this is a 2007 model. No kick-starter on this one! It is an 865cc twin-cylinder model.